Tell Us: Where is the Best Place to Hear Music? Where is the Best Place to Hear Music Where You Live? Tell us your favorite place to hear music is by commenting on this post with our new commenting feature. No need to log in. Nominate through Wednesday, April 27. Let's find out what is the best music venue! Tell Us: Where is the Best BBQ? Where is the Best BBQ Where You Live? Tell us your favorite BBQ place by commenting on this post with our new commenting feature. Nominate through Wednesday, April 20. Let's find out who has the best BBQ! Junior journalist auditions will take place today at the Galleria Mall in Centerville from 4-6 p.m. The child auditioning must be born between August 1, 1998 and August 1, 2001. You must bring proof of date of birth to the audition. The audition in Macon will take place Tuesday, April 5 from 4-6 p.m. in the Museum of Arts and Sciences. The children will be scored on the spot during the first round of auditions. The top scoring 50 kids will be called back for a second round, where they will answer questions on camera. A panel of 13WMAZ employees will judge those auditions. The top scoring 25 kids will move on to a final round that will be judged by a community panel. We will not contact the children between rounds 2 and 3. We will surprise the winning children in their classrooms before school lets out for the summer. 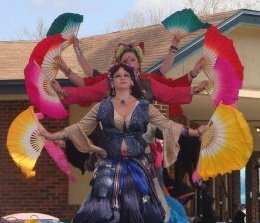 Perry Belly Dance will be featured at 3 performances next week at the Macon Cherry Blossom Festival. Perry Belly Dance, along with the professional dance troupe kabilaht a janub, will appear live on stage on Friday March 18th at 2pm, Saturday March 26th at 3pm and Sunday March 27th at noon. The belly dance troupe is typically booked for one show, but they have recently become fan favorites in Middle Georgia after their appearance at the GA National Fair last October. Perry Belly Dance is now offering belly dance lessons to students of all levels in the Perry and Warner Robins area. Our studio is conveniently located in Downtown Perry, GA and we are also available for private and group lessons at our studio or at your site. Classes include: Beginner, Intermediate, Advanced and Professional belly dancing. We will also be offering additional classes and workshops in the near future.